11/8/2012 (Dayton, Washington) - 1994 El Paso, 3 horse, custom living quarters trailer for sale. Looks and pulls great. Would make a perfect high school, college, amateur rodeo trailer, or perfect for camping and hunting as the dividers in the back come out and will fit an ATV, snowmobile, etc, perfectly. The interior has a large bed, wood cabinets, microwave, small television, shower, sink, toilet, A/C, mirrors, etc. You will not find another one like it for the price. $12,500 OBO... must sell... If you are interested please contact me via call or text at 775 842 1331. Thanks. Join in and write your own page! It's easy to do. How? 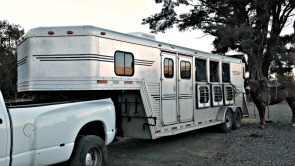 Simply click here to return to Horse Trailers.